I'm Mandy. I make cakes. And I sew things, too. 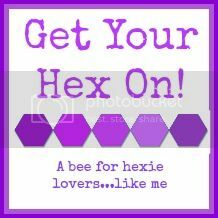 Disclaimer: If you've found yourself at this post because you are a bee member of Get Your Hex On, then I want you to know that I do not expect you to assemble my September block in the following process. In the first round of the bee, one of my mates asked how my hexies were sewn together because it was different than she had seen before, and this is a very belated 'tutorial' on my process. So, if you like learning new methods, then read on and enjoy! On to the meat of it... how I baste and sew together my hexagons! 1. You'll need fabric and hexagons (or any other EPP shape you'd like, this process works for them all). I get mine from Paper Pieces (this is not an affiliate link, just a product I love!). 2. Hold together one hexie and one piece of fabric. 3. Use a Wonder Clip (this is not an affiliate link, either) to hold the first fold. I LOVE LOVE LOVE MY WONDER CLIPS and this is yet another reason why they're awesome! 4. Fold the fabric over the next corner. 5. Hold folds together tight, but not stretched over the paper. 6. Run your needle/thread through just the fabric layers at the fold at a generous 1/8" in from the point. I leave a 1" to 2" tail when pulling my thread through the first time to avoid having to tie a knot. 7. Run your needle/thread through the fabric layers again very close to the first pass. 8. Pull until you feel tension. If the thread continues to pull through with ease, run a third stitch through the corner and that should lock it in. 9. Move the Wonder Clip into its 'permanent' position over the first sewn corner. 10. Fold over the second corner. For a tighter fold, use your needle and roll the fabric over (this is my go-to folding method when my fabric pieces are on the small side). 11. Repeat steps 6 and 7. 12. On the last corner, ensure the fabric is tucked under completely, the needle-roll comes in handy on this step as well. 13. Run a stitch through the first corner to complete the circle. I find that the hexie is more stable this way. 14. Start the next hexie with the same thread, leaving about 1" between. 15. Repeating steps 2-13, continue basting, creating a chain of hexies. Cut apart the hexies when ready to assemble into a block or project. 16. Start with two hexies, right sides together, and aline the edges. Use a Wonder Clip to hold the hexies together while sewing. 17. Knot your thread, and run your needle/thread under the seam allowance and out the ridge. 18. This is where my process differs from most... I use a blind hem stitch. Pick up a single yarn from the ridge of each hexie. 19. Loop the tail thread over the needle. 20. Pull the loop tight to form a knot. 21. Repeat steps 18-20 closely to the first knot. 22. Continue to repeat steps 18-20 as often as you feel comfortable with, I usually stitch every 1/8" or so on my 1" hexies. 23. When you reach the end of the ridge, squeeze in two stitches to lock the edge together. 24. Pull final stitch tight. 25. Back of joined hexies. 26. Front of joined hexies. As you can see, you can barely see the dark brown stitching. A similarly colored thread becomes invisible. 27. With right sides together, aline a third hexie with one of the two joined hexies. 28. Repeating steps 17-24, join the third hexie to the existing pair. 29. Remove the Wonder Clip. 30. Use a running stitch down the seam allowance of the third hexie along the joined seem to get your needle thread back to the center of the trio. 31. Aline the ridges of the two unjoined hexies and secure with a Wonder Clip. Pull your needle/thread out the ridge as in step 17. 33. To protect the final stitch, secure the tail with a whip stitch within the seam allowance. 34. Here are your joined hexies, basting stitches in red, joining stitches in brown. 35. On the surface, those joining stitches are barely visible! Ta-da! I usually wait to remove the paper until the project is completely assembled and sewn together. I typically press with the papers in, and then again after I remove them. However, what I love about this basting method is that the hexie will continue to hold it's shape if by chance the papers fall out from all the folding and squishing during assembly. And here you go... with the papers removed! The only pressing this little trio saw was with my fingers as I was taking pictures of the assembly process and look at how nicely formed they are! If the basting stitches are done with a thread of a similar color, you could very well just leave them in, no need to remove something that isn't getting in the way. Wow! That was a long post... so if you've made it to the end here, THANK YOU!! Let me know if you have any questions on any of the steps, I'm happy to help! After being so happy in our last apartment for over four years, hubby and I had a really hard time getting comfortable in our current one, it's simply too small. So in two weeks, we're officially leaving apartment living behind and renting a condo from a private party. We're excited! There's so much more space, and an attached two-car garage, and it's in a super cute little neighborhood full of parks and public use areas. We're hoping to call this place home for the next few years or more. Fortunately, we never fully unpacked into our current place. Unfortunately, between school and work, getting the packing that needs to be done will have to be done at a fever pitch. The boxes we (I) unpacked last year are still labeled, and the goal is to reuse the boxes in the same way again. I'm hoping this process will take less organizing since I can just pack what the box tells me to, instead of having organize everything beforehand. I think it's a sound theory, I'll let you know how it is in practice. I'll be dark for a bit I now, but there's a special 1st Birthday in August (not to mention Hubby's birthday) and a Wedding coming in September that'll have cake-tastic related posts. And of course I'm still sewing. I have a few projects that I need to share, so look forward to that. I'm really excited about the amount of space I'm going to have in our new 'creative' room (office/sewing/crafting/design/etc.etc.). I might even have to do a post on the room itself when all is said and done! Well, the last two months flew by in a blink, now didn't they. I've been hard at work in school again, I've gone back to work again, and I've picked up caking a bit again, in addition to sewing, cooking, tutoring, and otherwise just doing stuff. BUT the semester has ended, for three weeks anyway, and I'm taking the opportunity to get caught up on my WIP lists (yes, plural) as well as add in a few other projects that I just cannot say no to. I've got a few new cookie and cake projects to share with you, but that'll be in another post next week. (I STILL haven't edited all the photos.) I'm now two months into my first Quilting Bee and it's been a blast thus far! The following images we're taken with my iPhone, sorry. In April, we worked on flowers for a Flower Ball Wall Hanging, and in May, we got to make sewing machines! We each had a different size to work on, but they are all made of black fabrics. I worked with 1/2" Hexies, and boy are they addicting! It all came together so quickly, which I'm very glad for because I wasn't able to get started on it until just this past Friday. But it shipped out yesterday and is headed all the way to the UK! Our May Queen also sent us teenie-tiny 1/4" Hexies to play with... oh my am I in love... but that'll have to be a project for another time. Our June Queen Bee has sent out her packets and we are all patiently awaiting their arrivals as well as the instructions we'll get tomorrow. Can't wait! Tomorrow also marks the arrival of the June Lucky Stars Block pattern. I am WAY behind right now, but plan on catching up next week. I hadn't mentioned this BOM club yet because the finished product is going to be a gift for someone, but since I'm linking to my flickr account with the above images, you're bound to see my blocks thus far anyway. I suppose I could make them private for the group members only, but that would require having my flickr password. Long story, but all I will say about flickr customer service is that you should not ever NOT EVER lose your account password. You will never get it back. You will be forced to cross your fingers everyday that the cookies on your iPhone are never erased because otherwise you will be locked out permanently. You will hate flickr. You will wish everyday that there was a better way to join in on sewing fun, but resign yourself to whispered curse words every time you need to posted a finished project. You will hate flickr. End of rant, back to Stars. This has been a great paper pieced BOM by Don't Call Me Betsy! My very first quilt, which I haven't blogged about yet, was a paper pieced Circle of Geese Quilt. I absolutely love paper piecing! So this BOM is right up my alley. Alright, I think I've taken up enough of your time today. Have a great weekend! Since I plan on being more active on this here lil'l website/blog, I'm looking into ways to make it easier for you all to find and/or follow me. So with news that Google Reader will be fading away in rather the near future, I'm trying out Bloglovin... so we'll see how it goes. I joined my first Sewing/Quilting Bee! Yea!!! This bee is all about the Hexie craze that just won't quit and I'm really looking forward to getting to play along. My month will be October and I've already started some planning in that I have my fabrics chosen, but as for the pattern, my mind is far from made up. Next week, I have some cookie-time planned as well as a lot of sewing. The plan is to do it all with the camera near-by, I need some actions shots for you all! I'm keeping my promise, and posting today about my awesome iPad keyboard!!! Yea!!! Unfortunately, though, when I went to use the Olympus for some action shots, I found the batteries dead... so this post will not be as photo intensive as I had originally planned. However, since I love this keyboard so much, count on it making appearances in future posts. In my humble opinion, this IS the greatest iPad keyboard ever! Hubby bought it for me about a month ago and I've used it almost everyday since, and it's still on it's first charge! I love that it attaches magnetically just as the iPad Smart Cover does, without adding a noticeable weight. It makes quick work of notes during a lecture, emails during your morning coffee, and blog posts when the mood strikes! Now, it doesn't have the standard shortcuts for copy/paste functions we are all used to, BUT there are function keys that do the same thing. You can search your iPad for a particular app, contact, song, etc with a simple keystroke, as well as turn the iPad on or off. I have no problem using the keyboard that is built into iOS on the iPad, but there is something that is so tactically and audibly pleasing about this clicky Logitech keyboard. It makes me want to type and type and type some more! Lucky you! It come in black or white to coordinate with your iPad, and there's even one in red! And Logitech just released a version for the mini! ** This 'endorsement' is based solely on my own experience with the product and I have not be compensated for my opinions. Copyright © 2009-2013, Amanda C. Peterson. All rights reserved.